Hitachi Solutions endeavors to raise the social awareness of all employees, and supports their involvement in social initiatives and volunteer activities. 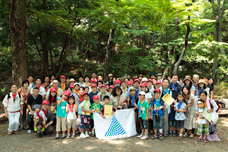 In addition, Hitachi Solutions strives to exercise good corporate citizenship, with initiatives focused on education, the environment and social welfare. We work to contribute not only to the development of a sound information society but also to enrich society as a whole. Hitachi Solutions has been conducting classroom lessons at elementary schools since fiscal 2011, as part of its CSR initiatives in the field of education. The program is designed to augment a fifth-grade social studies curriculum unit that explores today's information society and how it affects people's lives. The program is implemented in two parts, with an introductory lesson taught by an elementary school teacher followed by a classroom lesson taught by an employee of Hitachi Solutions. The program incorporates elements of social studies, IT education, and career education, and is aimed at fostering students' interest in IT that supports social infrastructure, and fostering ICT literacy that is valuable to students now and in the future. 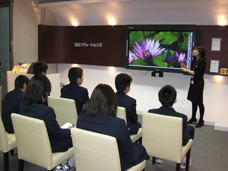 The classroom lesson taught by a volunteer employee of Hitachi Solutions is conducted using a StarBoard interactive whiteboard, a Hitachi Solutions product, linked to tablet devices. This enables the instructor to display and pose questions on the whiteboard, for students to answer using tablets. In this way, answers can be shared on the whiteboard to facilitate interactive learning. 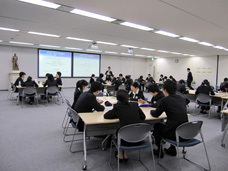 Hitachi Solutions organizes classes on information ethics for the seventh-graders of Tokai Junior High School, near the company's headquarters in Shinagawa Ward, Tokyo. The classes are spread over two days and are part of the citizenship education curriculum. Employees donate their time to teach the students about the positive and negative aspects of information. In addition to learning about the advantages of IT from the perspective of an IT company, students examine problems in an information society including the prevalence of unofficial bulletin boards where damaging rumors sometimes appear. The classes are aimed at better equipping students to look out for themselves in an information society. Working in groups on the subject "What is IT?" Employees of Hitachi Solutions teach a class on IT fundamentals for ninth-grade students at Tokai Junior High School, as an elective course under the technology curriculum. The class leverages Hitachi Solutions' expertise to teach students about the workings of computers. Students also learn to create simple programs for manipulating robots. Since 2007, Hitachi Solutions has offered a systems engineer (SE) internship program for third-year university students who are preparing to graduate and subsequently enter the workforce. The internship gives students the opportunity to experience and learn about SE and sales activities at an IT company, and gain a better grasp of what is involved. The program offers a half day of basic study in a group setting, as well as an additional three-day advanced class in programming and practical skills acquisition for selected applicants who complete the basic study. In the latter component, groups of five or six students form project teams and work on resolving a business problem for a hypothetical customer. The students learn programming basics and then develop an actual system based on a design specification. The "1 Day Shop" initiative is a temporary vendor table program to sell goods produced by facilities that employ persons with disabilities. The program was started in 2009 as a way to support persons with disabilities and have a positive impact in the area of social welfare. Hitachi Solutions used to offer the MediStyle invoicing ASP system, which was released in August 2007 for business operators who provide welfare services for persons with disabilities under the Services and Supports for Persons with Disabilities Act enacted in October 2006. Through the former MediStyle customer base, Hitachi Solutions offers the vendor program to sell goods manufactured at Tokyo area facilities that are members of Kyosaren, a national umbrella organization for facilities that support and assist adult persons with disabilities. Hitachi Solutions donates satellite imagery captured by the QuickBird satellite operated by DigitalGlobe, Inc. of the US, to support disaster reconstruction and for use in education. 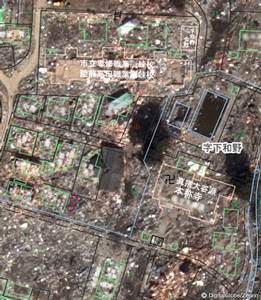 The satellite imagery has been used to support reconstruction efforts following the 2011 Christchurch earthquake and Great East Japan Earthquake. Seventh-graders from Tokai Junior High School in Shinagawa Ward, Tokyo can elect to participate in a workplace tour of the head offices of Hitachi Solutions. The tour consists of a presentation on Hitachi Solutions, followed by visits to our showroom and a look at some prototypes. Students learn about the company and its employees as well as the work that an IT company performs. Hitachi Solutions is involved in municipal environmental initiatives in Tokyo, where the head office is located, and other municipalities across Japan. Hitachi Solutions is involved in Minato Net, a social action network for companies that have offices in Minato Ward, Tokyo. Through the network, Hitachi Solutions shares and exchanges information with other companies on social initiatives. Hitachi Solutions also organizes community events for social action, in collaboration with non-profit organizations and other entities. 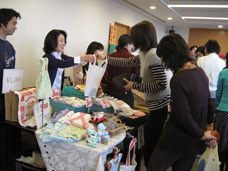 These events provide opportunities for Hitachi Solutions employees to interact with residents of Minato Ward. 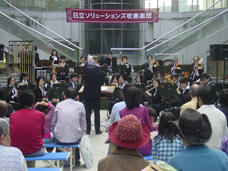 The Hitachi Solutions Brass Band regularly holds concerts both for music appreciation and to encourage cultural exchange. The band also performs jointly with music students of Tokai Junior High School, to bring music to the community. The band has performed at such venues as the Koyo Matsuri ("Autumn Foliage Festival") organized by the Shinagawa General Welfare Center, and the Shinagawa Culture Festival, which features performances by music organizations and groups that are active in Shinagawa Ward. These concerts provide a way for the members to interact with the community. Hitachi Solutions donates unneeded books as part of the School Support Program organized by JEN, a non-profit organization. The program raises funds to build and renovate schools in developing nations. Hitachi Solutions donates funds to a variety of organizations including the Hitachi Group's foundations, and to assist areas affected by natural disasters.